A mother of two young children has published a board book to help other parents teach their young kids the basics about God. 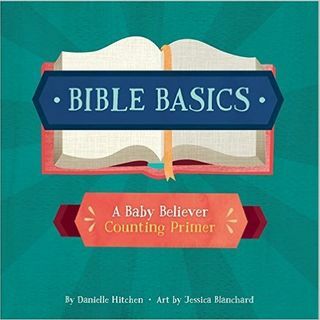 Danielle Hitchen is the author of “Bible Basics: A Baby Believer Counting Primer.” The Washington, D.C., mother self-published the title through Catechesis Books. Jessica Blanchard is the illustrator of this beautiful book. A board book is a book made of thick paperboard for small children. The thickness makes it more durable. Catechesis Books is a publishing company ... See More committed to producing materials to nurture the blossoming soul, according to Hitchen’s website at biblebasicsbook.com. For hundreds of years, Christians have practiced catechesis — a tradition of educating believers in the basic tenets of their faith — through prayer and study of scripture, through a formal catechism, and through liturgy and worship. By these practices, the essential truths of the gospel take root in the hearts and minds of believers of all ages, allowing their souls to blossom into an ever more Christ-like image. Hitchen said she wrote the book after not being able to find anything like it for her children, now ages 2.5 and 10 months. “I was looking for age-appropriate materials to teach them the basic tenants of the Christian faith,” she said. She found story Bible books, but those did not go into theology. One simple, but beautiful illustration, shows the concept of the Trinity: Father, Son and Holy Spirit. “This book does have some pretty big concepts for young kids,” she said. “I don’t expect small children to come away with a full understanding.” However, she said young children’s brains are “sponges” and they remember stuff. As they grow they start asking questions. She has seen this with her oldest daughter. Hitchen self-published because it is so hard to break into the children’s book market in traditional publishing. She is now working with an agent. She is receiving good feedback from other parents while talking about the book. Hitchen has been married for five years and has worked in radio production and non-profit administration. Publishing the book has been fun, because it has allowed her to draw on her skills. “Bible Basics” is available at biblebasicsbook.com and on Amazon.